Well.... We started the day in fairly clement weather and then.... We were hit by a massive storm with winds up to 100 mph, very heavy rain and hailstones lasting nearly an hour! We got absolutely soaked and only the hardier and wiser team members who had remembered their waterproof trousers as well as their jackets carried on after lunchtime. A sodden few retreated back down the hill! 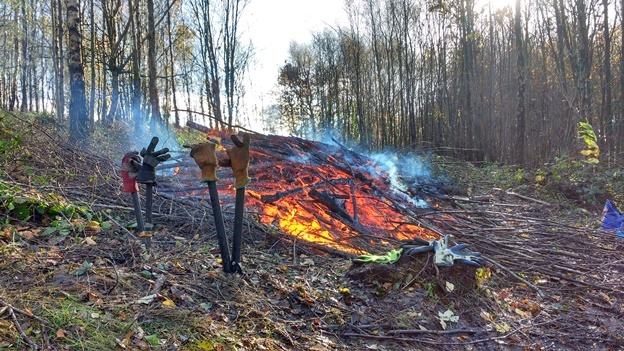 The sun re-appeared after the storm so our gloves were propped up to steam dry by the fire! 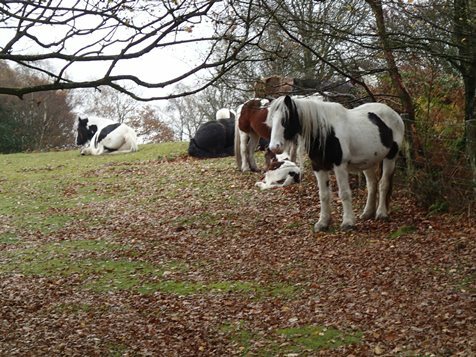 These are the semi-wild ponies who live on May Hill common and are shielding themselves near the wall before the storm. We have been contacted by the Dean Fungus Group (DFG) who have recorded an amazing 358 fungus on May Hill alone and their spread sheet can be downloaded on the left. The DFG is affiliated to the British Mycological Society and the Fungus Conservation Trust.